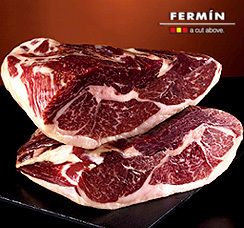 Iberico Ham is famous throughout the world for its quality, properties and exquisite taste. 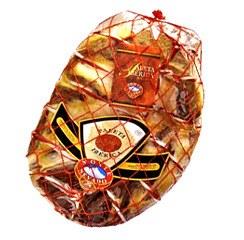 It is one of the treasures of Spanish cuisine which can be accessed now from the U.S. Iberico Ham possesses an exquisite aroma and a delicate flavor with no match. 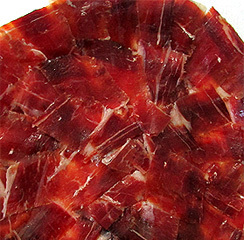 The meat of Iberian ham is rich in unsaturated fatty acids, is healthy, red and tender, the dish becomes a treat for your palate. 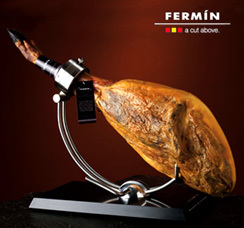 Iberico Ham is famous all over the world due to its exquisite taste and nutritional properties, considered as a piece of jewelry within Spanish culinary culture. 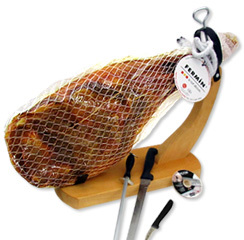 Now, we introduce a new and more economic way to enjoy iberico ham: Iberico Ham Hand Cut by Knife. 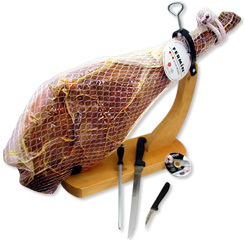 You will be delighted with the best properties, flavors and aromas that a “Maestro Jamonero” will get out of this ham. 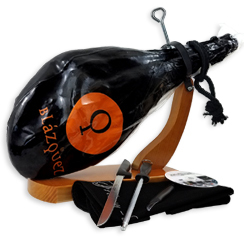 Ham Cheese Wine presents Iberico Ham Hand Cut by knife that will allow you to enjoy different flavors from the same ham, only possible when it is cut by knife and by our master in the art of ham slicing. Moreover, it is vacuum packed in packets of half pound and delivered to your door through "Second Day” postal service. 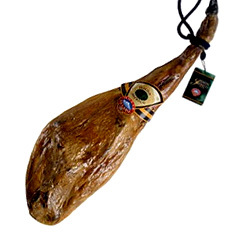 It is the best choice if you don’t want a whole piece of ham. 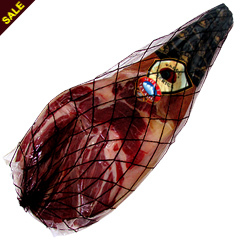 The packet of iberico ham hand cut by knife contains the different parts of the ham. 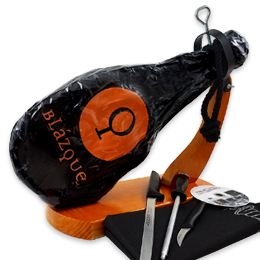 This iberico shoulder ham is distinguished for being the result of the experience of the ¨Maestro Jamonero”, that manage to achieve a texture and aroma. 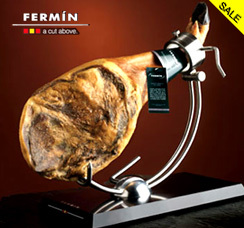 Ham Cheese Wine presents Iberico Ham Machine Cut that will allow you to enjoy different flavors from the same ham. Moreover, it is vacuum packed in packets of half pound. 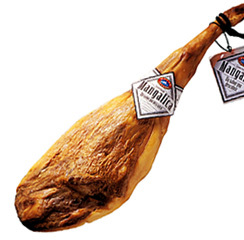 It is the best choice if you don’t want a whole piece of ham. 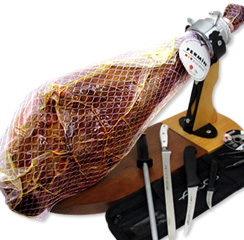 Iberico Ham machine cut is obtained from Iberico Ham boneless, the slices are packed immediately to avoid losing its properties and taste. 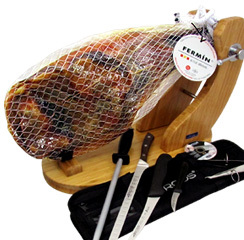 With this option you don’t have to worry about cutting a whole ham, neither finding the materials to do so nor learning the skills required to cut and enjoy a delicacy such as Iberico ham. 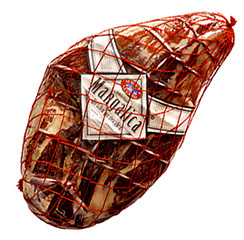 The packet of iberico ham machine contains the different parts of the ham (the thicker part, the thinner part, the tip, the stifle). This product is vacuum packet and sealed for better conservation. 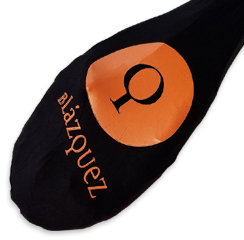 Blázquez’s methods upholds maximum quality through each phase of the product cycle guaranteeing that each mouthful offers the palate an authentic, unique experience in its aspect, texture, aroma and flavor. 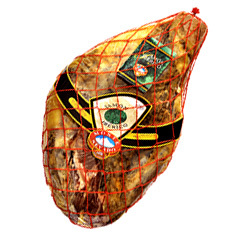 The Iberico Ham Monte Nevado Boneless, originally from Spain with guaranteed quality can be obtained at present from the United States. 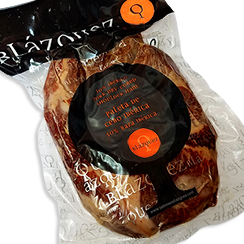 From the hind legs of the Iberian Black pig, with natural feeding based on grains and cereals and after a patient and controlled healing process this Iberico Ham Monte Nevado Boneless will let you enjoy of one of the traditional and most emblematic flavors of Spain. 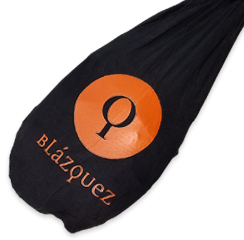 With wonderful organoleptic features and a valued flavor recognized worldwide. 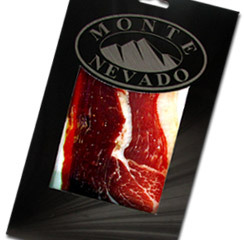 The Iberico Ham Monte Nevado Boneless fits any type of diet for being a low-calorie food, with an intense and complex flavor. 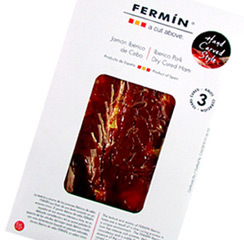 The Iberico Ham Monte Nevado Boneless fits any type of diet for being a low-calorie food, with an intense and complex flavor as well as an aroma and gourmet that you will not forget. 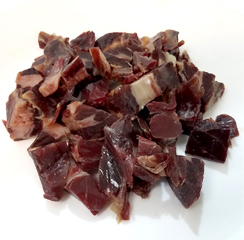 Selected from their own characteristics that demonstrate the purity of the breed, these pigs are fed on high quality grain in an extensive and free breeding regime. 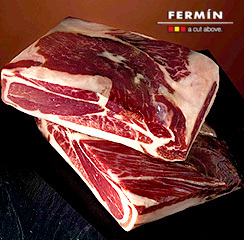 The Iberico Ham Small Cubes are obtained from the area of the knuckle and the cane of a freshly cut Iberico ham. 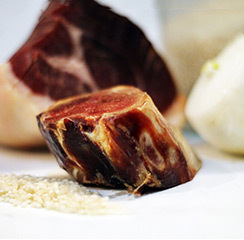 In this part of the Iberico ham, when slices can no longer be obtained, all the ham is removed and cut into small cubes of the part of the meat that is closest to the bone. 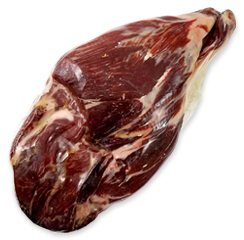 This meat that is so close to the bone has a more intense flavor and a unique consistency that makes it the most flavorful part of the Iberico ham. 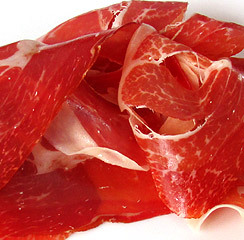 Iberian Ham Tacos are a delicious appetizer on their own, but they can also be used to cook or add them to dishes to enrich them like croquettes, to prepare ham tortillas, add ham to pizzas, pastas and salads.Weight half pound.